This page provides a full audit trail of all the decisions made in constructing and updating HadAT. Most users will not require all this information. If all you want is our recommended gridded product version or zonally / globally averaged versions of these then please go to the download data page where all relevant information is given. This audit trail is designed to be complete and accessible but we always welcome feedback that can improve the information presented. An editorial decision was made to present this audit trail description as a single long page to avoid endless clicking through links. This ensures that all information is available in the one place. Large data files are always presented as a choice of either ASCII (compressed) or netcdf files. In the netcdf files we have attempted to strictly adhere to the CF 1.0 conventions. Where files are large we have always tried to indicate the file size. Please note that this webpage should be read in conjunction with the HadAT dataset paper (pdf file), which provides further detail and justification of a number of the technical decisions we made. If there are any conflicts then the description in the paper takes precedence unless specifically noted otherwise (we may have made mistakes here and as it hasn't been strictly peer reviewed they are less likely to have been spotted and rectified). If any discrepancies or mistakes are found then it would be much appreciated if you could report these to the authors of the website (Holly Titchner and Peter Thorne). Timeseries and information up until HadAT2 data are limited to a seasonal or annual temporal resolution and to the beginning of 2002 (when the HadAT homogenisation analysis commenced). Only HadAT2 is available on a monthly resolution and updated in near real-time as outlined in Section 6. CLIMAT TEMP - monthly archives on 9 pressure levels held at the Hadley Centre. GUAN - median fit selection of all available station records for the GCOS Upper Air Network (GUAN) of 151 stations (now 161 stations) along with some gross Quality Control checks, courtesy of Mark McCarthy, Hadley Centre. Available on 9 pressure levels. MONADS - Monthly summary of the Comprehensive Aerological Reference Dataset (CARDS) from the National Climatic Data Center, Asheville, NC, USA. As for LKS these are available on 15 levels and at launch resolution. Please note this dataset has been replaced with a new dataset, IGRA - see section on real-time updating of the HadAT dataset later on. We subsampled all datasets to the 9 common levels (850, 700, 500, 300, 200, 150, 100, 50, and 30hPa). Only data recorded since 1958, the International Geophysical Year, was used. The reasons are two-fold: firstly, coverage dramatically degrades prior to this date and secondly there was a global 3 hour shift in observation times (from 0300/1500 UTC to 0000/1200 UTC) in 1957. Such a shift would prove impossible to rectify in a neighbour-based homogenisation approach as all records would be affected simultaneously and hence assumptions as to the adequacy of the neighbour-based background are grossly violated. To date we have limited our analyses to those stations for which it was possible to create a 1966-1995 climatology for at least one level and one of the digital sources considered. To create a climatology required a monthly value for a given month (e.g. December) to exist for at least 5 years of each decade over the climatology period. A full listing of these stations is given as part of the file hadat_station_information.txt which is supplementary table 1 in Thorne et al., 2005. For a description of the file contents please read the JGR readme file. We used annual layer thickness anomaly timeseries for the troposphere (700 to 300hPa) and the stratosphere (300 to 100hPa) to define a set of station series that were grossly consistent with a core network of LKS (87 station network) and GUAN stations that had been previously analysed and quality controlled. A small subset of these LKS and GUAN stations were found to be dubious in comparison to their "neighbours" and were deleted completely or in part - details are given here which is supplementary information Table 2 (again see the JGR readme file). Decisions as to inclusion in our first station set were based upon the similarity of the station series to the resulting modified neighbour thickness composites in the troposphere and the stratosphere (see section 3.1 in Thorne et al., 2005). The decisions are given in the microsoft excel file decisions.xls. Please note that this file contains a suite of visual basic macros. These do not need to be enabled for the file to be viewed. Please see the README sheet in this file for further explanation of how to interpret the results. The raw data that result from the decisions outlined in Section 1 were converted to seasonal mean anomaly timeseries on our nine pressure levels relative to a 1966-95 climatology. These series were gridded onto a 10 degree longitude by 5 degree latitude grid to form HadAT0. These are the "raw" station level data used as input to our QC procedure. In reality they are all post-processed to some extent. For CLIMAT TEMP and MONADS this post-processing is whatever was performed at the station plus gross QC checks. For GUAN there has been a median fit selection applied to all stations between data from CLIMAT TEMP and MONADS and some National Met Service archives, along with gross QC checks. LKS has had a much more thorough examination of the raw data to produce a high quality dataset which is available from John Lanzante at NOAA GFDL or the RATPAC website. The station sources used for each station are listed as part of hadat_station_information.txt (see Section 1). We analysed the station minus neighbour average difference series with the aid of a Kolomogorov-Smirnov test applied over a moving 30-season window to make our assessments as to break-point locations and the adjustments to be applied. We also used available metadata to help us in our decisions as well as our knowledge of events such as volcanoes, ENSO etc. Further details are given in Thorne et al. 2005 description of the dataset construction. This step inevitably involved subjective decisions being made as to the timing and existence of breakpoints within the individual station series. We used an iterative approach whereby the adjustments were calculated and deletions for gross errors identified. These were then applied; the station, neighbours, and neighbour difference series recalculated; and the procedure repeated until all stations were deemed to be sufficiently similar to their neighbour based estimates. Again, more details are available in Thorne et al., 2005. Adjustments were calculated using a bootstrap-type approach and were only assigned if a number of tests were passed, as described in Thorne et al., 2005. The final adjustments which are the sum of all deletions and adjustments given in the above files are given in the files hadat1_adjustments.nc (3.1 Mb) and hadat1_adjustments.txt.gz (2.3 Mb, compressed). Adjustments have been applied as a seasonally invariant change to all data preceding the breakpoint identified and are addative. Note that as necessary these station series have been renormalised at each iteration and in these final files so that they all have a zero 1966-95 climatology. These climatology adjustments are given in the files. The adjustments outlined in Section 3 were applied to the HadAT0 station timeseries data. These series were gridded onto a 10 degree longitude by 5 degree latitude grid to form HadAT1. As is evident from the analysis in section 1, and summarised in the excel spreadsheet decisions.xls, in defining our original set of candidate stations we had chosen to discard a large number of stations. These were originally discarded as the thickness series for each station was not considered to be significantly similar to a neighbour-average thickness series. They may have introduced gross inhomgeneties into the series containing the core set of stations. Figure 1 of Thorne et al., 2005 shows that the decisions were far from random. In particular we had rejected a large amount of Indian, Chinese, African, and tropical data. The importance of many of these regions in attempting to explain apparently disparate trends between the surface and the troposphere meant that we revisited these stations. These additional stations were incorporated in HadAT2. The decisions as to which station version to pick for HadAT2 were based upon the excel spreadsheet, but are not documented within the spreadsheet itself. The dataset source choice can be ascertained through an examination of the JGR supplementary table 1. The raw seasonal station timeseries are available as hadat2_raw_stations.nc (1.3 Mb) or hadat2_raw_stations.txt.gz (0.5 Mb, compressed). To homogenise these station timeseries we used HadAT1 as a neighbour network, with all HadAT1 stations contributing to the stratospheric neighbours. (See section 3 for the neighbour coefficients). In all other respects our procedure was identical to that employed in HadAT1. The formatting of the adjustments files is also identical to that employed for HadAT1 (see format_adjustments_files.txt). The final adjustments which are the sum of all deletions and adjustments given in the above files are given in the files hadat2_adjustments.nc (1.3 Mb) and hadat2_adjustments.txt.gz (0.2 Mb, compressed). The adjusted HadAT2 stations were added to the HadAT1 station series to create HadAT2. Up until now all of the analysis has been performed on a seasonal or coarser temporal resolution and only up until early 2002 when the HadAT homogenisation process was initiated. However, for the purposes of monitoring long-term changes it is useful to disaggregate this to the monthly resolution and update in near real-time. HadAT0 and HadAT1 remain frozen seasonal products to 2001, but HadAT2 has been updated as a monthly product. The final set of seasonal HadAT2 adjustments were applied to the raw monthly anomaly values that were originally used do derive the seasonal values. Deletions were applied to all three monthly values within each deleted season. The 1966-1995 climatologies were then recalculated to create the HadAT2 monthly product. Some of the original HadAT data sources are now unsuitable for updating HadAT2. GUAN is only available until 2001, the CARDS (and hence MONADS) dataset is no longer being updated, and the LKS dataset only contains data until 1997. The CARDS sucessor, Integrated Global Radiosonde Archive (IGRA), has therefore been used to update the HadAT2 stations which orginally contained data from GUAN and LKS as well as MONADS. A comparison between MONADS and IGRA data for a selection of HadAT2 stations showed no significant systematic differences on monthly timescales. 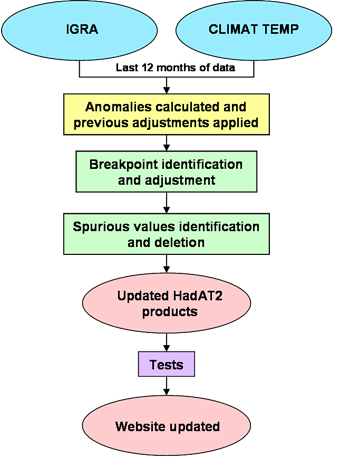 The HadAT2 monthly product was frozen until December 1999 and has been updated with new data from January 2000 onwards. The exception was the stations that originally contained data from the LKS dataset, as these were updated from January 1998 (see section 1 for a list of stations and sources). The new absolute temperature data was converted into anomaly space by subtracting the monthly station climatologies below. The monthly gridded climatologies are also available. (Warning: Climatology values may contain absolute biases as the homogenisation analysis is performed in anomaly space so cannot perfectly correct for absolute biases). To produce fully homogeneous dataset it was deemed necessary to develop some basic quality checks, similar to the ones employed in the initial seasonal dataset development. A neighbour difference series was calculated, as in the original quality control proceedure. A running first difference series was produced using 12 months values either side of each point, and a critical value was derived at each station and level from the 95th percentile of the pre-2000 absolute values of this series (which are assumed homogeneous following the completion of the QC). Any points within the new post-2000 data that exceeded this critical value at 3 or more pressure levels were flagged as being a suspected breakpoint. Manual intervention was required make the decision whether to adjust each of these potential breakpoints, by analysing plots of the difference series. See Figure 2 in the report on the updating of HadAT in near real-time for an example. The adjustments were calculated using the same method as in the orignal dataset development (see Thorne et al., 2005 for more details). A period of up to 3 years (36 months) either side of each breakpoint (trucated if there was another breakpoint identified within this period) was used unless the breakpoint identified was within the most recent 36 months. In these cases a period of 1 year (12 months) was used, although the adjustments will be recalculated in subsequent updates when a full 36 months worth of data following the breakpoint become available. No breakpoints are identified within the most recent 12 months as a 24-month window is required for their identification. Each adjustment was subtracted from all the points in the station series after and including the identified breakpoint (Note: post-2000 adjustments are subtacted and not added). Hence our monthly HadAT2 product has been adjusted to December 1999. The neighbour difference series was recalculated and any spurious values after 2000 that were equal to or greater than 3.5 standard deviations of the pre-2000 data were automatically deleted. The pre-2000 HadAT2 monthly product was combined with the new quality controlled data (post-2000) to create the updated HadAT2 monthly product. HadAT2 is now updated in near real time on a quarterly basis. Each quarter the previous 12 months of data is retrieved from the IGRA and CLIMAT TEMP databases. The temperatures are converted to anomalies using the monthly climatologies. Any previously calculated adjustments are applied to the anomalies (except those which require recalculating with the full 36 months of data either side of the identfied breakpoint). The anomalies are then passed through our quality control system, as described in the section above. The formatting of the update adjustment files is described in the file format_update_adjustments_files.txt. The file itself is linked below (Note: this file is updated periodically when HadAT2 is updated). The quality controlled data is used to update the current station series, which is then gridded. Various other products, including the zonal mean timeseries, the global mean time series and the tropical mean timeseries are also created. (See the HadAT2 page for all the monthly HadAT2 products that are updated in near real time.) A series of sanity-check tests (global mean looks sensible etc.) are applied to the HadAT2 products before the website is updated. There is a typical lag of approximately 2 months so that, for example, the data for January becomes available at the end of March or the beginning of April. The data is updated quarterly unless a specific request for an update is received. The CLIMAT TEMP monthly radiosonde data is no longer archived at the Met Office Hadley Centre. Since May 2007 IGRA data have been used to update all HadAT2 stations if available. This only affected a small proportion of the stations, which were previously updated using the CLIMAT TEMP archives (see hadat_station_information.txt). No significant systematic differences were found on monthly timescales due to this change in source data.